Posted by Melissa Parks on Aug.12, 2016 17:18:39 PM. One of the scariest things that can be experienced by most iPhone users is that when they try to change the phone or sync contacts or when they try to sync the phone to the backup/cloud is that they lose their contact details. 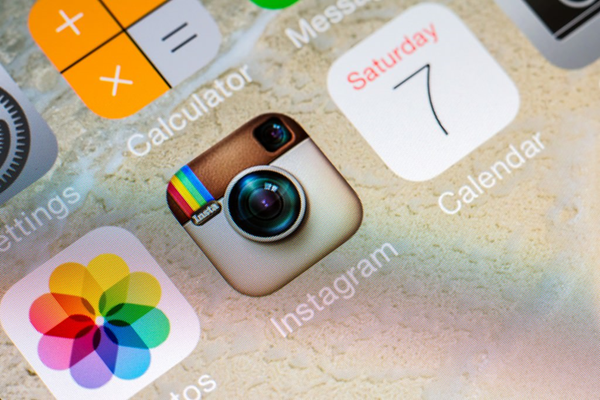 Many iPhone users have experienced that they lose one, two or more contacts in these processes. they don't know what do to except becoming helpless. This article provides three solutions for those who need to recover lost contacts from iPhone device, hope they are helpful! 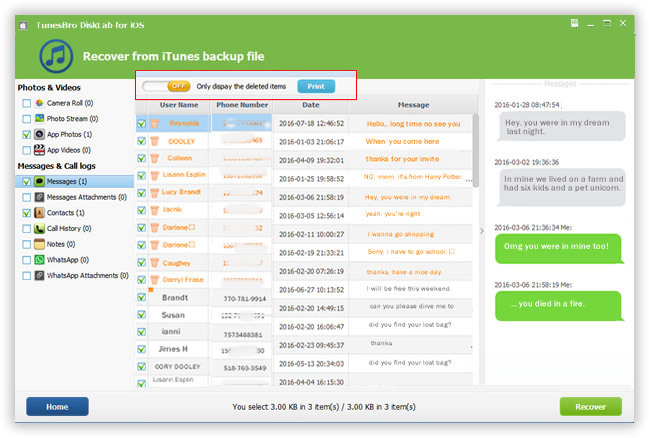 Even though Apple has made things easier with iCloud, but if you love following the old school practice, you will find iTunes to be an excellent solution even in the present world of iCloud backup. As long as you have a backup of the contacts of your phone in some place or another, you can easily restore it to your iPhone and reclaim the your deleted contacts in a simple manner. 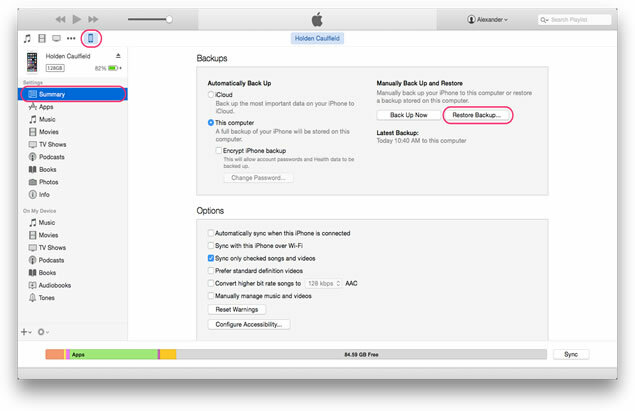 Apple's way is the most widely used procedures for restoring iOS devices from backup so far. But you must have an access to the computer on which you generated the backup. Step 2: Go to File > Devices > Restore from Backup, then select the latest backup and restore it. Reason one: In many cases, using Apple's official way to restore contacts really does the work, but in some cases it may not be acceptable, accessible, or advisable, because you might not restore your contacts successfully via iTunes backup due to some unknown errors, you know, the size of backups tend to get bigger and bigger and it will take long time to complete the restore process, some unexpected interruptions or crashes that happen and result loss of data during the process. Reason Two: Yes, you can see iTunes backup restoration it's all OK, but Apple's way only works for the entirety of backup, you're not allowed to select the specific content or type to restore. Reason Three: If your device was lost, stolen or damaged, iTunes can't allows you to export content to your computer for read, because the format of backup is not readable. So, we said Apple's way is not the best way. 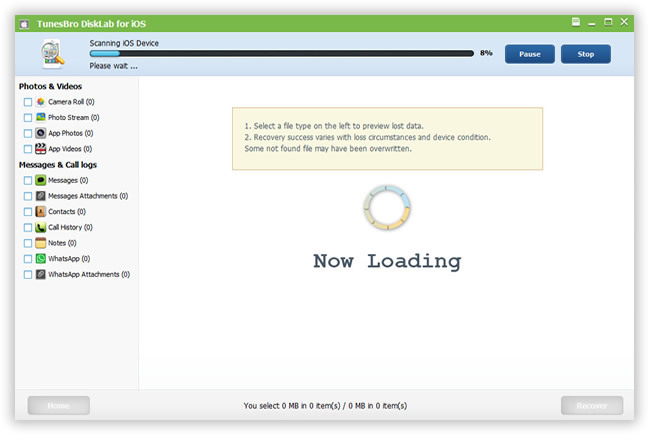 In such cases, a recovery tool like TunesBro DiskLab for iOS can prove indispensable. What's DiskLab for iOS and How it Works? We know data loss may be caused by many different factors including accidental deletion, software bugs, data corruption or your device broken. Whatever the reason, you still have a grate change to get back them back with or without backup. DiskLab for iOS could do you a big favor, which can simply recover and repair of data that has been lost from your iPhone, iPad or iPod device. DiskLab for iOS carry out the complex scanning algorithms that look at pieces of data that's left on your storage disk of iPhone in order to find where the data was physically stored, if the program find correctly, you will get your data back. If the deleted contacts hasn't been overwritten by new data, don't worry, the program still can restructure the data and restore this original form. 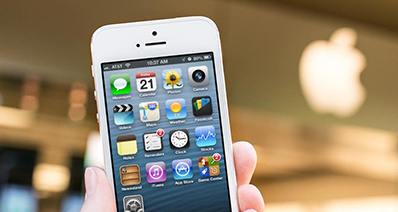 This iPhone data recovery application provides two modes to help restore contacts from iPhone device. 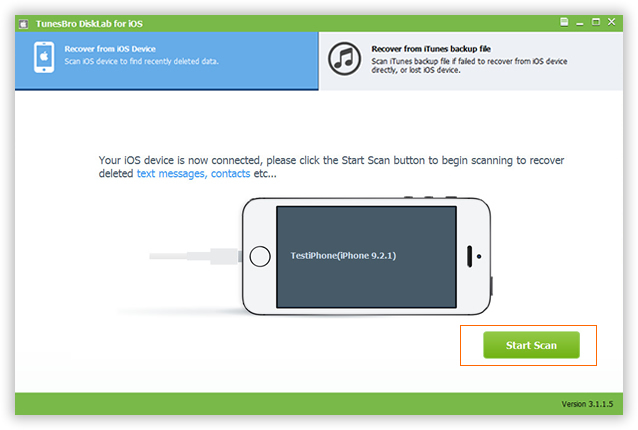 that's "Restore from iPhone" and "Recover from iTunes backup". 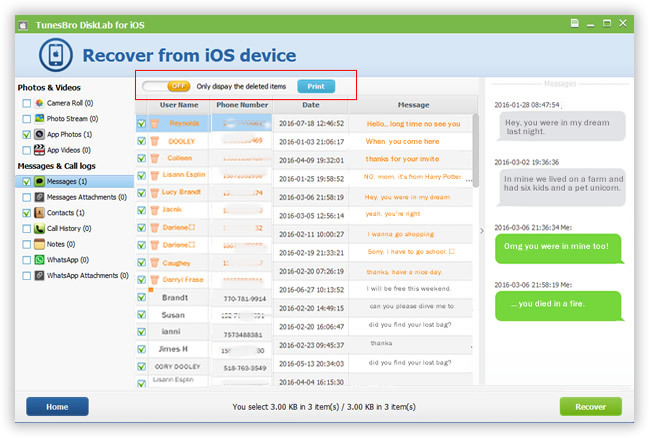 DiskLab for iOS can recover and offer previews for the following types of files: messages, contacts, photos, videos, call history and more... . For sms recovery, look at this tutorial to recover deleted messages on iPhone. Support: Available for all iDevices: iPhone SE, iPhone 6s plus, iPhone 6, iPhone 5, 4 and older versions, as well as iPad, iPod. First of all, download and install TunesBro DiskLab for iOS on your PC or Mac. You should connect your iPhone with the PC or Mac via USB cable. Then run it, it will automatically recognize your iPhone and you can see the main interface. Then select the option 'Recover from iOS Device' and Next. Here you should click Start Scan button to let the program to scan your iPhone for lost contacts or other data. The scanning process may last a few minutes based on on the amount of data on your device. Make sure your iPhone is connected to PC during the program. Once the scanning is completed, the scan result will be display all of your data including deleted and existing. You click the swipe button to only show the deleted items. To preview your lost contacts, must click Contacts tab in the left side. After then, click the "Recover" to start recover your deleted contacts. By default, the recovered contacts will be saved to your computer. 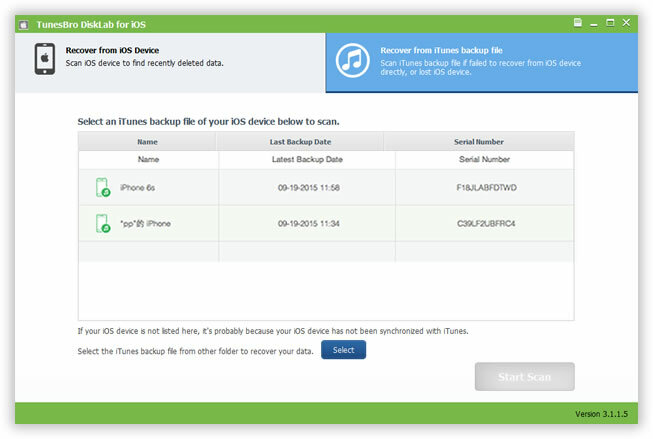 If your device has been damaged, broken, lost or stolen, and you can't access to your iTunes backup. Disklab for iOS allows you to brows your backup content and directly extract to your computer. To perform this operation, you can't need to connect your device to PC. If you want to extract contacts from an iTunes backup, click the "Recover from iTunes backup file" tab on home screen of DiskLab for iOS. Choose your latest backup file according to device name and date, then click "Start Scan" button. After the scan, your will see all your contents displayed as below, just click to preview them. Besides contacts, you also choose another type like messages. You can mark the contacts you want and click "Recover" button to save them on your computer. Yes, we know backing up your data is extremely important to keep your data safe in the event of a device disaster or you want to switch a new device. But if you have unfortunately clicked the "backup" button after deletion when you plug device to PC, then your iTunes backup will be overwritten by the latest one. So, you might have thought that you can get back the lost data from iTunes backup via Apple's way, you cannot. In this case, relying on the best DiskLab for iOS application for can be the excellent choice. Have you ever used data recovery software to recover lost contacts? Share your experiences below! Melissa Parks is a Senior Editor with TunesBro, based in Australia office. His current focus is on all things tech including iOS, Apple devices, desktop and laptop computers, software and more hands-on guides related iDevice.